The Satanic Temple filed a lawsuit against Scottsdale, Ariz., on Friday over the city officials’ refusal to allow a satanic invocation before the city council. Members of The Satanic Temple (TST) alleged that the Scottsdale city council actively sought to discriminate against satanists and to prevent non-Christian citizens from offering invocations before council meetings for the last eight years, according to a press release sent to The Daily Caller News Foundation. The satanists’ legal action against the city council, after city officials allegedly rescinded an offer to have TST member Michelle Shortt, lead an invocation and replaced Shortt with a Baptist minister. 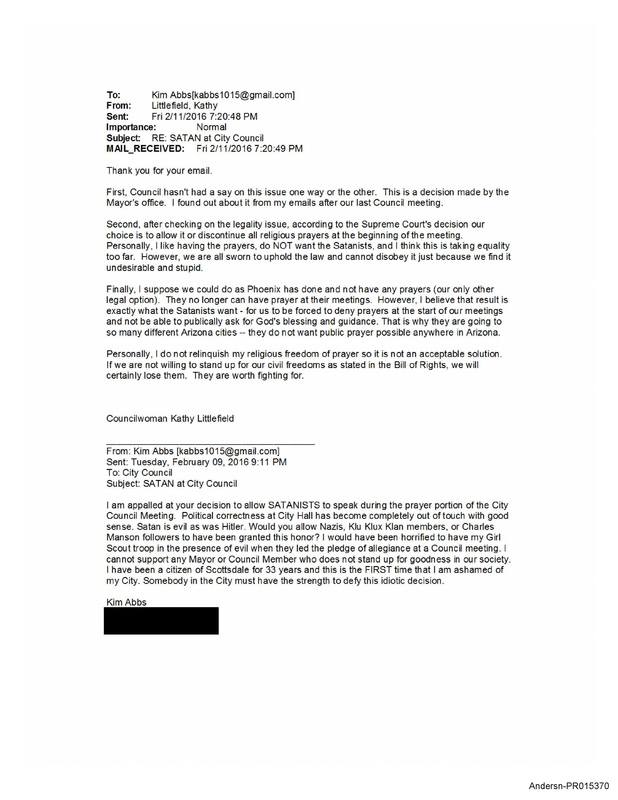 The temple also submitted records of the council members’ emails as evidence of the alleged discrimination. That councilman was David N. Smith, who actually wrote in his email to a concerned citizen that while he shared their sentiment that a satanist invocation was “a decision to worship evil,” their right to perform the invocation was protected by the Supreme Court’s interpretation of the First Amendment, no matter how absurd it seemed. “I wish (an intend) my deliberations on Council to be blessed and guided by God alone. I genuinely appreciate your input,” Smith wrote. Littlefield also stated that the council was, at the time, conferring with an attorney to discuss their options since, in her view, the satanists did not really seek to offer a prayer since they identify as atheists and don’t believe in any higher power. Later emails from the council members state that the satanists chose to postpone the invocation, which was scheduled for April 5, 2016. Stuart de Haan, attorney for TST, told TheDCNF in an email that Shortt had to postpone the invocation as she was out-of-state on the initially proposed date. Shortt agreed to reschedule for July 6, 2016, but city leaders reneged on the offer in the interim. “The city is not going to deviate from its long standing practice of having the invocation given only by representatives from institutions that have a substantial connection to the Scottsdale community. Therefore we are making other arrangements for the invocation to be given on July 6,” a statement from city officials read, according to 12news. “It’s disheartening when public officials can display such a flagrant disregard for the most foundational bedrock principles of Constitutional Law while acting upon their personal biases at the expense of their taxpayer base, who are ultimately left to pay the legal costs for the ignorance of their Mayor and City Council,” TST co-founder Lucien Greaves said in the press release.